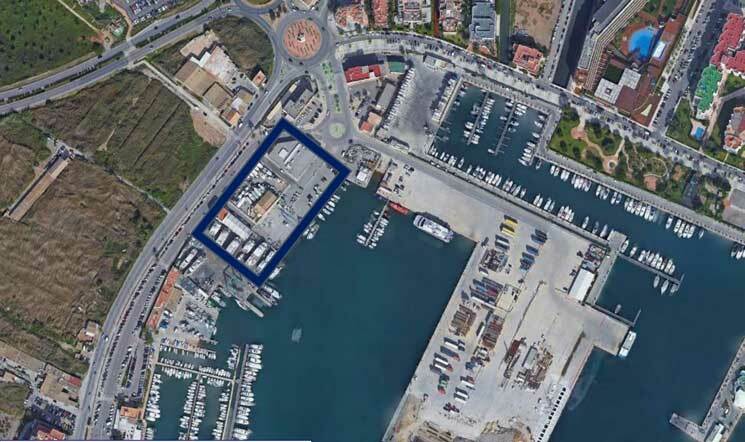 The Balearic Islands port authority and Ibiza town council have released details of a 27million euro project to build parking for 691 vehicles underground at what is the current fishing pier. The aim is to alleviate the lack of parking in the port especially during the tourist season. According to the president of this state body, Joan Gual de Torrella, the director thereof, Juan Carlos Plaza, and the mayor of Ibiza, Rafa Ruiz, the car park will have an area of ​​18,272 square metres and consist of a single floor. Although defined as an underground car park, only 2 of the 6 metres of height will be below sea level “making more floors and going to greater depth will make the works much more expensive”. Of the 691 places there will be 21 reserved for people with reduced mobility. The entrance will be next to the maritime office and connect to the roundabout of Podencos. It was confirmed that the project would be awarded before the end of the year, however this is subject to resolution of the usage delimitation plan of the port of Ibiza which is awaiting Ministry of Development ratification. Once works begin it will take a year and a half to complete during which time the Fishermen’s Association and the fishing wharf will be moved, as well as the other affected installations. The port authority has not yet decided where these facilities will be relocated to. It could not be confirmed which proportion of parking could be reserved for residents and businesses who have been campaigning for solutions to the lack of parking. When questioned by journalists at the press conference the mayor of Ibiza said, “The Port Authority is sensitive to what neighbourhood associations are asking for”, although he pointed out that it will be the specifications that will determine this issue. “Within what determines the specifications and legality, we will try to satisfy this demand. It is working, and it is still too early to say in what situation it will be ». “It has always been said that they will have a different treatment,” Ruiz added, although he reiterated: “We will work to achieve this goal, within reason, but it is still too early to say in what conditions it will be done”. Similarly, it is also not possible to know the price that users will have to pay for each space, something that must also determine the specifications that are drawn up. The cost of the work is estimated at 27 million euros, explained the director of the Port Authority. According to the requirements derived from the General Plan of Urban Planning of Ibiza, each parking space must have a minimum size of 2.20 by 4.20 metres, although 10% of the spaces will have to have a length of 4.80 metres. The minimum height will be 2.20 metres. AENA, the Spanish airport authority has announced details of 200 additional long-term parking places at Ibiza airport. The parking, which is already open, is only available by prior booking through the Ibiza airport website or the AENA mobile app. It is located in the staff car parks known as ‘E3’ which is accessed through barriers directed to the cargo terminal. In a statement AENA said users “can enjoy the peace of mind knowing their vehicle will not be moved or manipulated” and that the car park is monitored 24hours a day. The Parking shambles continues in San Antonio with nobody clear where the new blue zones are supposed to be in force, whether the timeclocks are in force, and the police still refusing to enforce laws which they say are not visible to the public due to a lack of signage of information. San An resident Kevin Wakefield summed up the situation in his minimalist post today, “San Antonio Parking, Impossible”. We couldn’t have said it better ourselves.